I'm from a very bookish family and always had several books on the go, esp. enjoying reading all of an author or subject serially and having a taste for well-written yet obscurish works. When I stopped being able to get in libraries and book shops Jim made it so the local library corporation sent me my choices by post. Then after a spate of purloined letters and packages the house got a locked box and books didn't fit in. :( I was still buying new and used books online but stopped that due to impecuniousness and thwhatnot. I started having real difficulty using books at all as my physical state deteriorated. End result: I mostly just read New Yorkers. When Enj visited in June she gave me a Kindle, and that has made reading physically possible as well as moved literary works within my reach. Thank you, Enj. Right now I'm reading a Fay Weldon that's a kind of new Decameron- stories as fun from characters at a spa (plague stood in plAce by bird flu and computer worm). Gawd typeratin on the pod is wearing. Update: I just saw online that in the USA it's called The Spa, but is actually titled The Spa Decameron. Apparently they think no one has read The Decameron or something. 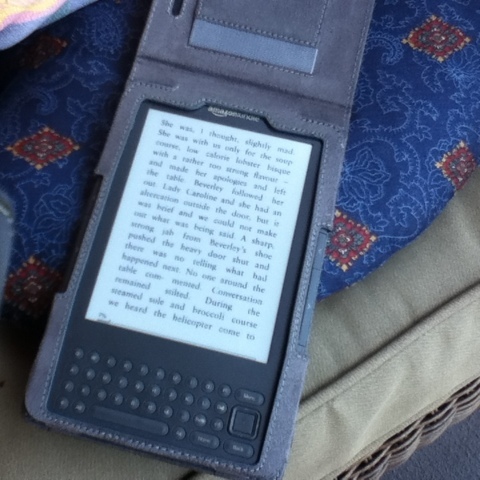 Once I got over the oddness of reading a book that didn't have actual pages, I loved my Kindle. We should share books! I watched Steve Jobs introduce the iPad. I thought pretty cool, but who needs one?? I bought one in Sept 2010 and I love it!! I read more now with it. Easier to hold in bed than a book; don't have to adjust a reading lamp. eBook sales have now surpassed physical books, yet publishers' profits are up over last year. I do miss the new paperback book smell. I remember in grade school when our Weekly Reader book orders would arrive. Once mine had been handed out I would sit at my desk getting high from sniffing my new books.